Pretty Dangerous Accessories Ladies, check out this website – they are offering some very nice custom made leather holsters. I received a sample, the Eggplant Ostrich, and WOW, it is gorgeous! It has a high quality steel clip that works on just about anything from jeans to purses to boots. If you are looking for quality and style, you should definitely check out these holsters. I give them 5 stars! Chelsea Kyger, Product Designer for Women and Guns, has created a new design “Scarlet Pistols”! Pictured here on her custom range bag. Members of the club may want to consider ordering accessories with this design from our Women and Guns Store. More women throughout the United States are buying guns and learning how to use them. And we’re finding that to be true in South Dakota. In fact, a 2011 Gallup Poll found that 43% of women say there’s a gun in their home. KSFY’s Courtney Zieller is finding out why numbers are at a new high. It’s Corin Forester’s first time shooting a handgun and she liked it. “The first round, I was shaking a little bit and nervous but by round three I was putting it in there and getting at it and it was really fun,” Forester said. Hearing more women are getting into the sport doesn’t come as a surprise. “It doesn’t surprise me that more women are buying guns. Growing up I said I can do whatever the boys can do,” Forester said. And she’s not the only one. More women throughout South Dakota are signing up for gun classes and learning how to shoot. “In the past three months that we’ve been teaching, we’ve noticed a rise in out students being female,” John Johnson said. Army Sgt. John Johnson teaches a concealed carry weapons class in Sioux Falls. 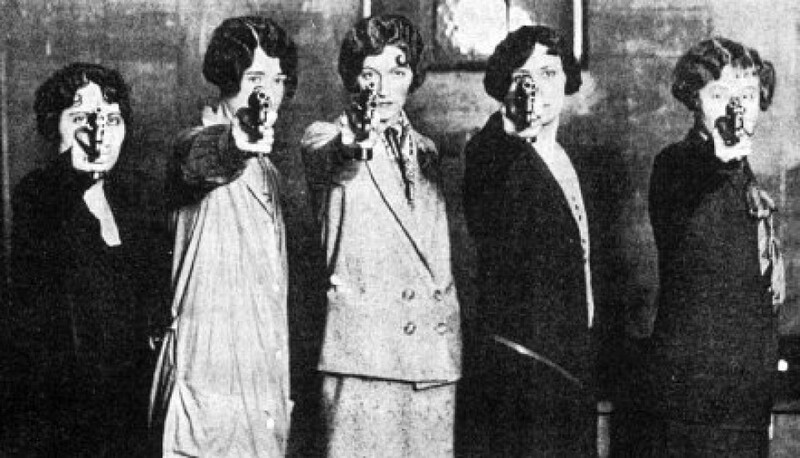 And his group, Permit to Carry has seen the rise in women for quite some time. “We’re kind of the rural farming communities but more in areas like central Minnesota, Rodgers, the place else we teach, there’s been a pretty much a constant rise since 2004,” Johnson said. And that rise has now lead to women only classes and leagues which are being offered around the Midwest. And any one of us girls can learn the skill. “The people I teach who have no background in shooting are the easiest and the quickest to learn and pick up techniques that I’m trying to give to them,” Johnson said. And to see if he’s right, I decided I wanted to take a shot at it — no pun intended. I’ve never even picked up a handgun before so before I could shoot, Johnson showed me the basics. “As long as it feels natural but no death grip. What we want is 30% with this hand and 70% with this hand,” Johnson said. So once I ditched the death grip, it was onto learning the proper positioning. “Both arm bring them up evenly and have even recoil management,” Johnson said. And how to properly insert the magazine. “Your right hand, the one that will be shooting should always be on the pistol for loading,” Johnson said. Then I was ready to chamber a round. After the third maybe fourth try, I finally got it. “Just pull it back and feel the resistance. Just like that,” Johnson said. Now I was ready to shoot — well, sort of. “Then I want you to look more at the front site and center it on the target,” Johnson said. Let’s just say the first three shots were not great. “The first shot was here on the mound, second shot ripped the paper, third shot,” Johnson said. But the last two were pretty good. So not bad for my first time. “You’re well on your way to being a natural,” Johnson said. But so are many other women. And Johnson thinks the reason more women are getting involved isn’t only because they want to get into the sport. And don’t let pink guns fool you. “Personally protection is really becoming more of a gender less aspect,” Johnson said. And when it comes to protection, Johnson says you should first start with education. “To know exactly and under what guidelines and what criteria need to be present for ever, ever using your handgun and only in it’s strict sense your life is in danger and that’s it,” Johnson said. All in the hopes never having to use it for protection but only for fun. The Concealed Carry Weapons class is being offered in various locations. One location is Scheels in Sioux Falls. They are offered once a month. The next one is in June. Classes run about six hours. You can get permits for five different states: South Dakota, Minnesota, Iowa, Florida and Utah. To find a location near you or to sign up call Laura Ramirez at Permit to Carry at (218) 252-1631. The group also has a web site. Click on the link at the upper left. Gary’s Gun Shop in Sioux Falls is also offering gun classes in the fall.